The Muppets DVD Review. In conclusion, The Muppets movie really delivers and fans of the original TV series will have a blast seeing all their favourites return and younger viewers will appreciate the wackiness of these puppets. 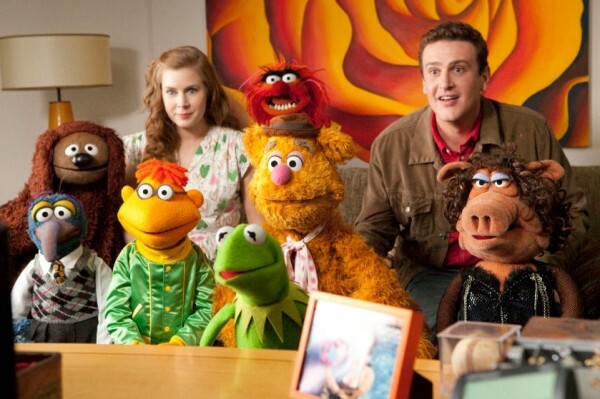 Written by Jason Segal (How I Met Your Mother) and Nicholas Stoller, Walt Disney Pictures have backed these two whacky writers in order to revitalise The Muppets franchise. However the question is, can these puppets first created in 1954 by the late great Jim Henson find a place in the competitive 21st century movie market? The answer is yes and no. If you grew up watching Jim Henson's legendary Muppets or were a fan of these strange looking puppets, you'll probably enjoy the latest movie but if you've never had any interest in the Muppets, you'll probably think what am I doing! Children on the other hand, will easily relate to the colourful characters but for adults, it'll definitely be a mixed bag if you're not a fan. Fortunately director James Bobin does a brilliant job at not only paying homage to the original TV series, The Muppet Show but ensures that its themes are adequately changed to suit a modern audience. 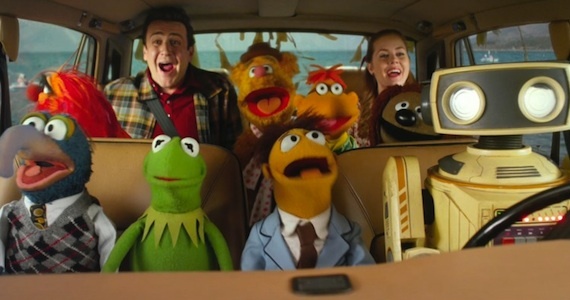 This is more so because of Jason Segal who plays Gary (How I met Your Mother), one of the writers responsible for this story that seemed to be having a ball in this movie and must be a die hard Muppets fan. His passion definitely rubs off on you! Like the original TV series, the movie features a stellar cast of actors and cameos that include Amy Adams, Rashida Jones, Chris Cooper, Zach Galifianakis, Jack Black, Alan Arkin, Emily Blunt, Neil Patrick Harris, Whoopi Goldberg, Selena Gomez, James Carville, Ken Jeong, Sarah Silverman, Donald Glover, Mickey Rooney and Jim Parsons. It definitely doesn't get any stellar than that! When it comes to the story, the pacing of the film works well, however during the later part, it does slow down a little too much, especially with the "conflict". With that said, the two main protagonists of the film are Gary (Segal) and younger brother Walter (Peter Linz) who happens to be a muppet. There is no mention made in the entire film why Walter is a puppet or why he has a human family but it's definitely amusing to watch. Both brothers are inseparable and live in this almost "Leave it to Beaver/Truman Show" city called Smalltown that is as wholesome as they come. It should also be noted that the Muppets is part musical and the first song "Life's a Happy Song" sung by the amusing Segal and his cohort Walter not only explains their history together but is a real hoot to watch. Music also played a key role in the original TV series. The third wheel in this relationship is the lovely Amy Adams as Mary, Gary's girlfriend who is the local primary school teacher and generally takes a back seat to Walter. However when Gary asks Mary to accompany him to California for their tenth anniversary, Walter is also invited as Gary is afraid to leave him alone. The plan for the trio is to visit the Muppets studio as both Gary and Walter are huge fans and then for Gary and Mary to go on a romantic dinner. Needless to say, things don't go according to plan, especially when Walter overhears nefarious oil magnate Tex Richman (Chris Cooper) informing his "evil" Muppets that if the Muppets don't come up with 10 million dollars before a set deadline, than their old studio, including all merchandise rights becomes his property. The dilemma has been set and Walter, Gary and Mary embark on a "mission impossible" to get the Muppets back together again in order to raise the 10 million dollars to save their studio. From here, they go on a road trip to get the old crew back together that includes favourites such as Fozzie, Gonzo, Animal and of course, Missy Piggy who now works for Vogue in France. There's also some great cameos that include Rashida Jones, Jack Black, Alan Arkin, Emily Blunt, Ken Jeong, Sarah Silverman and Zach Galifianakis as a very amusing hobo. These cameos are just like the TV show. As the Muppets work their magic to clean up their ageing studio in order to host the Muppet Telethon, the greedy Mr. Richman once again interferes in order to reclaim the studio to dig up the oil under their studio. From action to romance and even a surprise marriage, The Muppets definitely pays homage to the original TV series and it's great to see all the Muppets again. My only gripe with the story is that certain Muppets were given a backseat role but given the length of the movie, it is understandable. I did however see my favourites in the spotlight! The video and audio quality on DVD is great with vibrant colours, clear images and crystal clear sound. Special Features are unfortunately lacking with only the longest Blooper Reel ever made (in Muppet History) gracing the disc. It was fun to watch but I was hoping for something more. In conclusion, The Muppets movie really delivers and fans of the original TV series will have a blast seeing all their favourites return and younger viewers will appreciate the wackiness of these puppets. 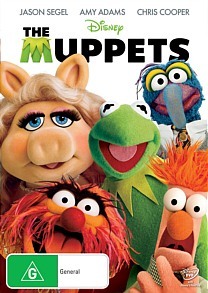 I was actually quit surprised at how well these Muppets portrayed emotions, especially Kermit and Miss Piggy. It's definitely a comedy movie that can be watched by the whole family with a few nods of the hat to adults with the innuendos. Brilliantly funny!